I’m starting to come around on salads. Historically, I haven’t been much of a salad person but this summer we’ve been enjoying them for dinner at least once a week. Salads, I’ve finally realized, hold more possibilities than just convenient leafy receptacles for all the items I’m looking to clear from the refrigerator crisper. I spent a bit of time conceptualizing today’s Grilled Peach Salad with Toasted Pecans, Blue Cheese and Honey Balsamic Syrup, debating in my mind between toasted and candied pecans, blue cheese or goat cheese, arugula or no arugula. I was really happy with how it all materialized on the plate. I caramelized sweet, juicy peaches on a hot panini grill, then arranged them over a bed of mildly peppery baby arugula, filled them with a few dabs (not too much!) of tangy, creamy Point Reyes Original Blue and a smattering of toasted pecans and finally drizzled them with honey balsamic syrup. Preheat an oven or toaster oven to 350°F. Spread the pecans on a baking sheet and toast in the oven for 4-6 minutes until they are aromatic. Set them aside to cool. Preheat the panini grill to high heat. Brush a little melted butter on the cut sides of the peaches. Place the peaches on the grill, cut side down. Close the lid so that the upper grates are hovering just above the peaches or just very lightly touching them. Grill the peaches until they are softened and grill marks appear, about 4 to 5 minutes. 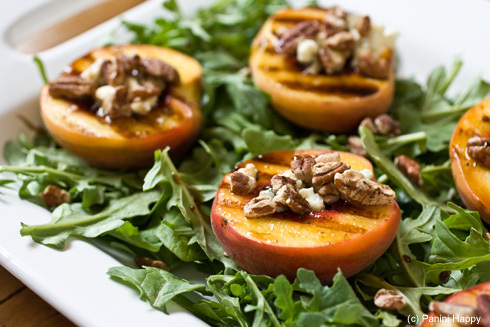 Arrange the peaches cut side up over a bed of arugula on a serving platter. Top with toasted pecans and blue cheese and drizzle with honey balsamic syrup. What a pretty salad, love the combination of sweet grilled fruit, salty blue cheese, crunchy pecans, and tangy balsamic syrup! I could easily get used to this salad every day as well. We just had a similar dish at a local restaurant. It was fabulous! Thanks for sharing. This salad is like summer on a plate – love it! Yum, Kathy! This is a DELICIOUS looking salad! Peaches are so fabulous this time of year in the northeast, I’ll have to make this! I think you could win anyone over on salads with this combination! That is a beautiful salad! Wish we could get decent peaches here. This salad look so elegant and delicious! Such a pretty salad Kathy! What a visually appealing salad! I love a really good salad with different textures and flavors… they are so much more satisfying. This salad almost looks too good to eat. Love that you used arugula for the greens. It’s peppery flavor makes me want to do a happy dance every time I have it. 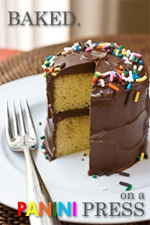 I am so curious about this dish I’m gonna have to make it soon. 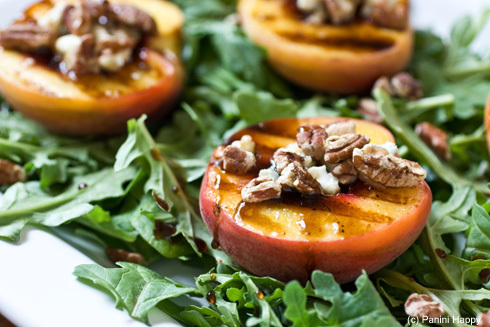 Grilled peaches and pecans… heaven. Looks great! I LOVE salads, glad you’re comin around 😉 What a beauty too! This is a salad I could dig into. Arugula is on the shopping list. 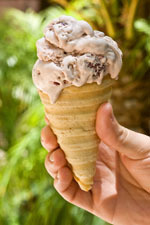 I need to make this before the fresh peaches disappear from the Farmer;s Market. I adore grilled peaches but we always have them for dessert. I never once thought to include them on a salad. What a great idea! He came bearing peaches. And we loved him all the more. | We Call Him Yes!Chef!